Paul Klee (1879 – 1940) was both a German and Swiss artist who falls under the Expressionist and Surrealist movement. Influenced by a variety of styles, Paul Klee’s artwork was quite inventive, not falling into one specific classification. The selections of prints by Paul Klee that we carry here at Affordable Art 101 are just as random as his productions when living. Showcased in our online collection are colorful prints with geometric hints, other lithographs expressionistic in style. Paul Klee had a diverse journey as an artist, working with Wassily Kandinsky at the Bauhaus school of art and joining Die Blaue Vier with Kandinsky and two other artists. 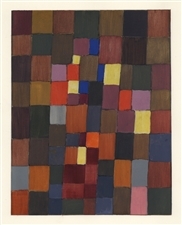 The group showcased in the United States in 1925, the same year that Klee’s artwork in Paris grew acclaim with Surrealists. His international and well-rounded art career produced thousands of pieces of art, some paintings which can sell for more than $7.5 million. 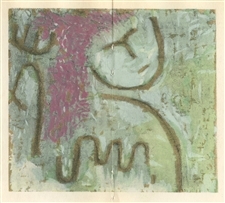 Paul Klee pochoir "Astral Sentinel"
Medium: offset lithograph with pochoir hand-coloring. Published in Milan in 1958 by Silvana Editoriale d'Arte in an edition of 200. 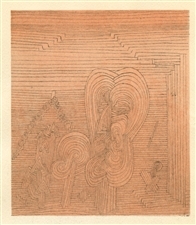 The image measures 11 x 7 1/4 inches (280 x 200mm) with good margins. Not signed. Very scarce. 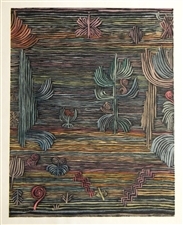 Paul Klee lithograph "Tete d'enfant"
Medium: lithograph. Published in Paris by Teriade for Verve (Volume 1, Number 5-6), in 1939. Verve was founded in 1937 to showcase original lithographs by the leading artists of the day, with outstanding technical quality. The full sheet measures 14 x 10 1/4 inches (353 x 263 mm). There is a different lithograph on the back side, as issued. Not signed. Condition: there is some discoloration in the margin near the edges of the sheet, not affecting the lithographed image. 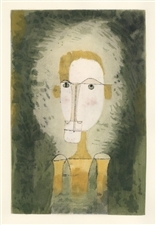 Paul Klee pochoir "Saint of the Inner Light"
Medium: pochoir (after the lithograph). 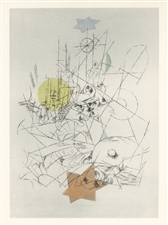 Printed in New York by Esther Gentle and published in 1947 for a portfolio issued by the Museum of Modern Art in an edition of 2000. The image size is 9 1/2 x 5 1/4 inches (240 x 135 mm) and the full sheet measures 12 x 9 inches. Signed in the plate, not by hand. 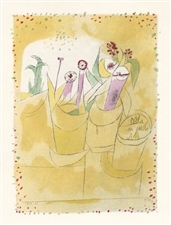 Paul Klee pochoir "Flower Table"
Medium: pochoir (after the watercolor). Printed in New York by Esther Gentle and published in 1947 for a portfolio issued by the Museum of Modern Art in an edition of 2000. The image size is 7 1/4 x 5 3/8 inches (186 x 134 mm) and the full sheet measures 12 x 9 inches. Signed in the plate, not by hand. 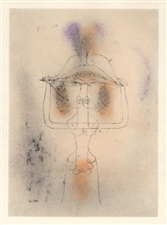 Paul Klee pochoir "The One in Love"
Medium: pochoir (after the lithograph). Printed in New York by Esther Gentle and published in 1947 for a portfolio issued by the Museum of Modern Art in an edition of 2000. The image size is 9 1/8 x 6 1/4 inches (233 x 160 mm) and the full sheet measures 12 x 9 inches. Not signed. 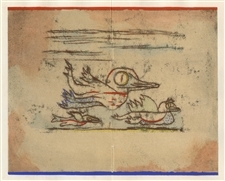 Paul Klee pochoir "Singer of the Comic Opera"
Medium: pochoir (after the lithograph). Printed in New York by Esther Gentle and published in 1947 for a portfolio issued by the Museum of Modern Art in an edition of 2000. The image size is 9 1/2 x 6 3/4 inches (240 x 170 mm) and the full sheet measures 12 x 9 inches. Not signed. Medium: pochoir (after the lithograph). Printed in New York by Esther Gentle and published in 1947 for a portfolio issued by the Museum of Modern Art in an edition of 2000. The image size is 8 x 6 inches (205 x 155 mm) and the full sheet measures 12 x 9 inches. Signed in the plate, not by hand. 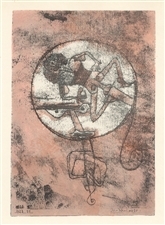 Paul Klee pochoir "Tightrope Walker"
Medium: pochoir (after the lithograph). 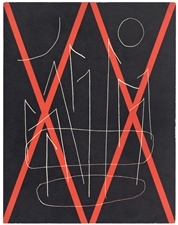 Printed in New York by Esther Gentle and published in 1947 for a portfolio issued by the Museum of Modern Art in an edition of 2000. The image size is 9 1/2 x 5 3/4 inches (240 x 148 mm) and the full sheet measures 12 x 9 inches. Not signed. Medium: lithograph (after the 1933 gouache). This impression was printed in Paris by Mourlot Freres, and published in 1961 by Berggruen. The total sheet measures 8 1/2 x 4 1/2 inches (220 x 113 mm) with no margins. Not signed. 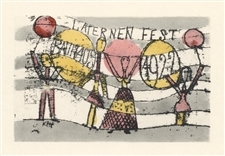 Paul Klee pochoir "Lantern Party, Bauhaus"
Medium: pochoir (after the lithograph). Printed in New York by Esther Gentle and published in 1947 for a portfolio issued by the Museum of Modern Art in an edition of 2000. The image size is 3 1/2 x 5 1/2 inches (90 x 143 mm) and the full sheet measures 12 x 9 inches. Signed in the plate, not by hand. Paul Klee pochoir "Destruction and Hope"
Medium: pochoir (after the watercolor). Printed in New York by Esther Gentle and published in 1947 for a portfolio issued by the Museum of Modern Art in an edition of 2000. The image size is 9 3/8 x 6 5/8 inches (240 x 168 mm) and the full sheet measures 12 x 9 inches. Not signed. For an affordable way to include a piece of Paul Klee’s artwork into your home gallery or studio, browse our authentic prints! The original and rare prints are priced lower than any other online dealer!